I’ve been warning my readers for weeks — and it’s starting to get discussed on TV, too — that we may well see an “earnings recession” in 2019. Multinational stocks account for about 50% of the S&P 500’s sales…and they’re now fighting a strong currency headwind. Remember, when a company does business overseas, then has to translate that into U.S. dollars, they either win or lose in that bargain. And right now, they’re losing. As long as we’ve got Brexit, the Italian recession, France’s yellow-vest protests, and a whole host of other problems abroad, the United States will remain an oasis. Which means the U.S. dollar will remain strong. So, to be successful, you want to own stocks that will NOT get hit with this double-whammy: the earnings recession, and the dollar dilemma. That means you want strong fundamentals…and you want to be as domestic as possible. This is the sort of task that my Portfolio Grader makes simple and easy. Here are three stocks with great earnings — made right here in the United States. Crown Castle (CCI) owns and operates cell phone towers and fiber-optic networks in Texas, California, Florida, the Great Lakes, the Northeast, and a few metro areas elsewhere in the country. So, it’ll be a key player in the 5G wireless internet rollout. The company is structured as a real estate investment trust (REIT). And what’s really great about REITs is that they are required to return at least 90% of their taxable income to shareholders in the form of dividends. 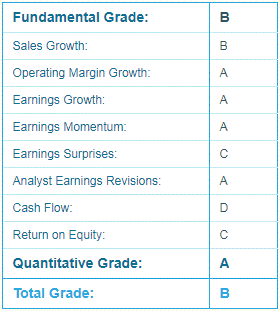 While cash flow leaves something to be desired, CCI did receive an “A” for its Quantitative Grade. That’s a proprietary indicator I’ve built into Portfolio Grader, and basically tells you if the stock’s seeing strong buying pressure. I believe in “following the money,” as that’s the most important signal of a stock’s health. Another all-American stock is Citizens & Northern (CZNC). As a northern Pennsylvania-based bank that also operates in New York, it has little to fear from a strong dollar. UDR, Inc. (UDR) is also one to consider. This one’s another REIT, but it owns multifamily properties. And it’s one of the biggest apartment REITs around; based in Colorado, it also operates in California, the Pacific Northwest, Texas, Tennessee, Florida, the mid-Atlantic and the Boston metro area. While it does have some areas to improve, UDR stock gets top grades on growth in sales, operating margins and earnings, and is turning in positive earnings surprises. What I’ve just showed you with UDR, CCI and CZNC is just a taste of what Portfolio Grader can do for you. At Growth Investor, I’ve just published a quarterly guide I call the Portfolio Grader 500. In it, you’ll find 250 A- and B-Rated powerhouses…as well as 250 D- and F-Rated “sell immediately” stocks. Click here to find out how to secure a free copy, and see how UDR, CCI and CZNC stack up against others in their industries (or elsewhere). Now, dividends are great — I recommend plenty of income stocks for my Growth Investor Buy List — but they can sometimes be difficult to assess. You want to make sure that juicy yield comes from a strong dividend…not a stock in trouble. 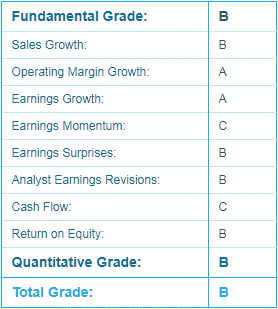 If the stock earns an “A” on those factors, as well as from Portfolio Grader, that’s when I really get interested. I’ve given this small group of stocks the nickname “Money Magnets.” And I’d like you to get a look at my briefing on the topic — FREE at this link.